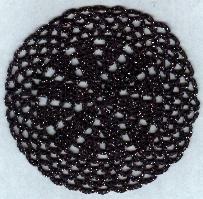 As many of you know, I lost this pattern when I transferred my crochet pages to Tripod. One slip of the finger was all it took. Thanks to a wonderful, wonderful person, I now have the pattern once again to post for your use and enjoyment! Many, many thanks to Betty Hammond for emailing me and sending me the pattern. One thing I have learned is to make LOTS of copies, both hard copies and backups of these things. Betty - you are a dear sweet person. Thanks with all my heart! Size 10 cotton thread (I used the black with the silver metallic thread), approximately 25 yards. Ch6, Join with sl st to form ring. Round 7 - 10: sl st in first ch-3 sp, ch 1, sc in same space, ch 3, sc in next ch 3 space, ch 3 around. Join with sl st to first sc. At end of row 10 fasten off and weave in ends. This pattern is copyright 1998 by Theresa Dunlap. All rights reserved. Please feel free to use this pattern for your own use, but do not post it to other websites, bulletin boards, email lists, or any other form without written permission from me. Keep this copyright statement with all copies.